Nature's Gate Oral Health - Crme de Anise Toothpaste (Fluoride Free). Support healthy gums and teeth with Creme de Anise Toothpaste from Nature&rsquo;s Gate&reg;. This toothpaste is free of fluoride and sulfate and contains an antioxidant blend of seven herbs to boost oral hygiene and health. This toothpaste contains botanicals that may freshen your breath. The antioxidant blend contains cranberry&sbquo; white tea&sbquo; pomegranate&sbquo; and grapeseed to potentially protect gums and teeth from free radical damage. Calcium appears to strengthen teeth and protect tooth enamel from demineralization. Baking soda in this toothpaste from Nature&rsquo;s Gate&reg; may work as a gentle abrasive to remove plaque deposits and reveal whiter teeth. Aloe&sbquo; Ginger and bisabolol are known to ease gum irritation and provide soothing effects. Quillaja Saponaria&sbquo; or soap bark&sbquo; root extract works as a foaming agent and may cleanse teeth thoroughly of deposits. Reveal pearly whites that radiate health and keep your breath fresh with Creme de Anise Toothpaste -from Nature&rsquo;s Gate&reg;. These statements have not been evaluated by the Food and Drug Administration (FDA). These products are not meant to diagnoseÃ¢ÂÂ treat or cure any disease or medical condition. Please consult your doctor before starting any exercise or nutritional supplement program or before using these or any product during pregnancy or if you have a serious medical condition. Nature's Answer Oral Health - PerioBrite Natural Toothpaste, Cool. Support the health of your teeth and gums by brushing them twice daily with PerioBrite Coolmint Toothpaste from Nature&rsquo;s Answer&reg;. 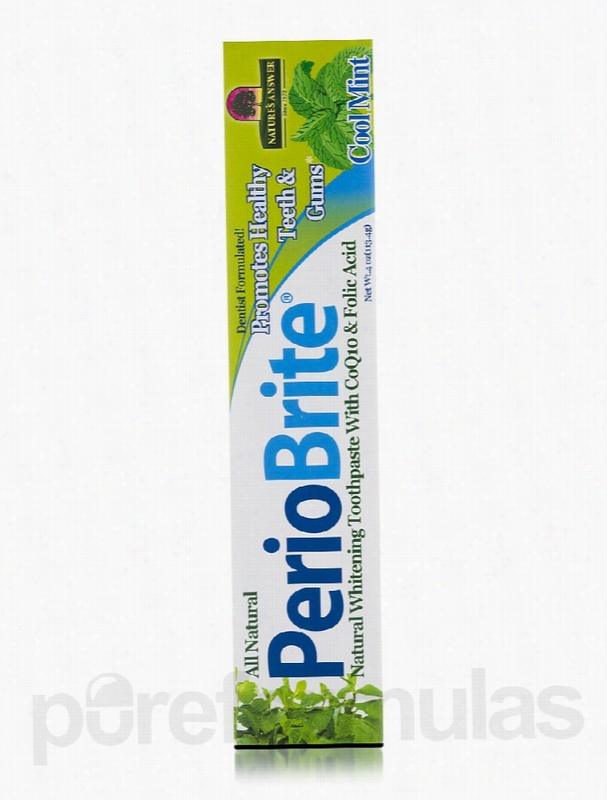 PerioBrite&reg; is a non-abrasive formula that gives you clean and shiny teeth&sbquo; while promoting gum health. Bio-Saponin&trade; could work as a mild foaming agent to enable thorough cleansing of food deposits from teeth. Extracts of clove&sbquo; cinnamon&sbquo; eucalyptus&sbquo; black walnut&sbquo; lavender&sbquo; oregano&sbquo; and thyme could prevent or combat microbial growth in your Oral cavity to avoid infection. Chlorophyll and peppermint in this toothpaste from Nature&rsquo;s Answer&reg; may freshen breath. Coenzyme Q10 and green tea are antioxidants that prevent free radical damage. CoQ10 may also support the health of your gums and periodontal tissues. Xylitol appears to keep caries and cavities at bay. Folic acid helps support your gums while olive leaf provides immune support to protect teeth from infections. Leave a fresh and energized feel in your mouth with PerioBrite Coolmint Toothpaste from Nature&rsquo;s Answer&reg;. These statements have not been evaluated by the Food and Drug Administration (FDA). These products are not meant to diagnoseÃ¢ÂÂ treat or cure any disease or medical condition. Please consult your doctor before starting any exercise or nutritional supplement program or before using these or any product during pregnancy or if you have a serious medical condition. 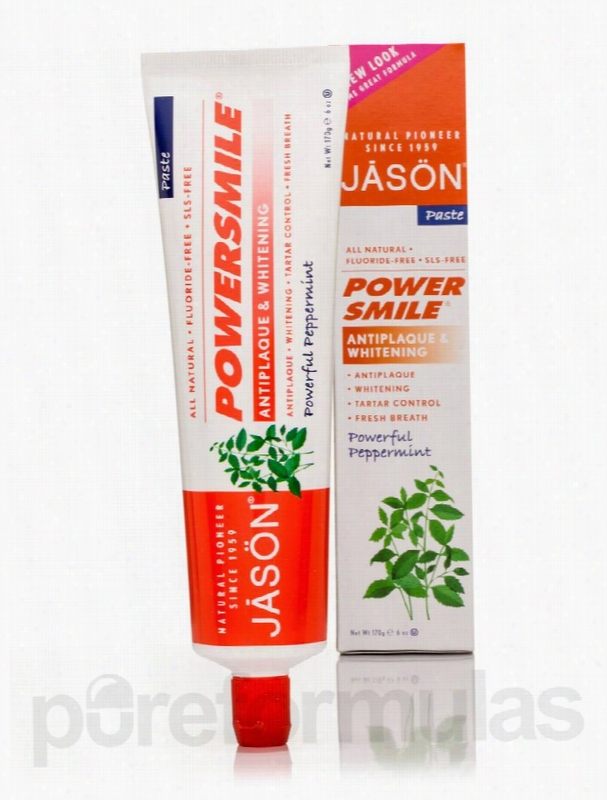 Jason Natural Products Oral Health - PowerSmile Antiplaque & Whitening. Use the PowerSmile&reg; Antiplaque &amp; Whitening Toothpaste Fluoride-Free from J&#256;S&Ouml;N&reg; Natural Products for a naturally white&sbquo; healthy smile. Oral and dental hygiene is very important and toothpastes like this one might be a good way to keep your teeth healthy. The fluoride-free toothpaste from J&#256;S&Ouml;N&reg; Natural Products contains ingredients like bamboo powder and baking soda to help your teeth stay healthy and clean. Bamboo powder may gently polish the teeth&sbquo; while baking soda&sbquo; calcium carbonate&sbquo; and silica may help prevent the build-up of plaque and tartar. They could also work to whiten your teeth. The paste also contains grapefruit and perilla seed extracts that might reduce the impact of harmful sugar acids from the foods we ingest. The peppermint oil is added to keep the mouth feeling fresh and clean. For best results&sbquo; it is recommended to brush your teeth at least twice a day. PowerSmile&reg; Antiplaque &amp; Whitening Toothpaste Fluoride-Free from J&#256;S&Ouml;N&reg; Natural Products does not contain sodium lauryl&sbquo; preservatives&sbquo; colors&sbquo; sweeteners&sbquo; saccharin&sbquo; propylene glycol&sbquo; or gluten. These statements have not been evaluated by the Food and Drug Administration (FDA). These products are not meant to diagnoseÃ¢ÂÂ treat or cure any disease or medical condition. Please consult your doctor before starting any exercise or nutritional supplement program or before using these or any product during pregnancy or if you have a serious medical condition. Seroyal Oral Health - Homeofresh Toothpaste Anise Flavor - 2.5 oz (84. To support your teeth and gums&sbquo; the right toothpaste is essential. However&sbquo; you may want to avoid artificial ingredients. Seroyal&rsquo;s Homeofresh Toothpaste (Anise Flavor) contains nothing but natural fresh plant extracts like allantoin&sbquo; which comes from comfrey root. Allantoin provides many of the anti-inflammatory effects that may soothe gums. Meanwhile&sbquo; xylitol is a natural sweetener that may inhibit certain cavity-causing bacteria and the formation of plaque&sbquo; while also supporting strong tooth enamel. 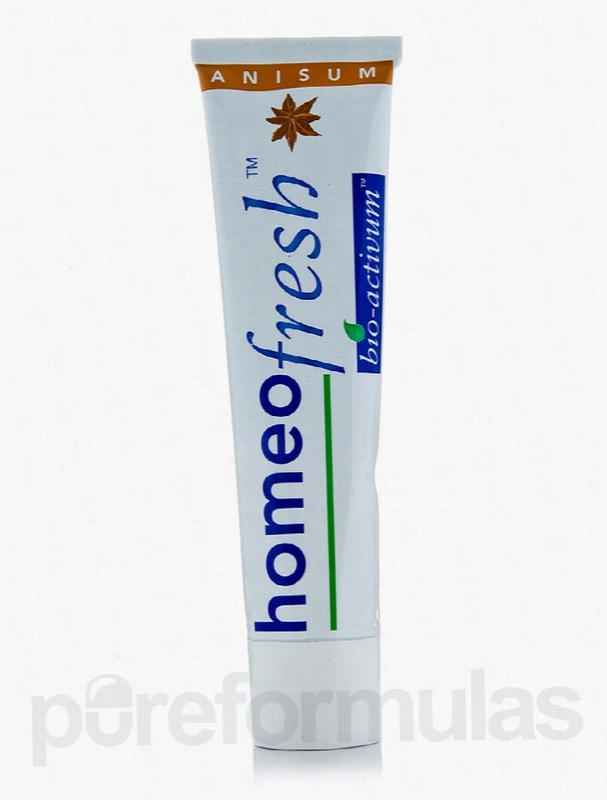 This homeopathic toothpaste supports periodontal health&sbquo; while working to fight off gingivitis. Homeofresh&rsquo;s use of bioactive ingredients supports the natural oral flora ecosystem while stimulating the growth of new&sbquo; healthy tissues. In addition&sbquo; it&rsquo;s non-abrasive&sbquo; making it less likely to cause harm to your tooth enamel. Homeofresh Toothpaste is safe for both adults and children! The anise flavor also gives it a subtle licorice taste&sbquo; while helping your mouth look and smell great. Each tube contains 2.5 ounces; use a pea-sized amount every time you brush your teeth. These statements have not been evaluated by the Food and Drug Administration (FDA). These Products are not meant to diagnoseÃ¢ÂÂ treat or cure any disease or medical condition. Please consult your doctor before starting any exercise or nutritional supplement program or before using these or any product during pregnancy or if you have a serious medical condition. 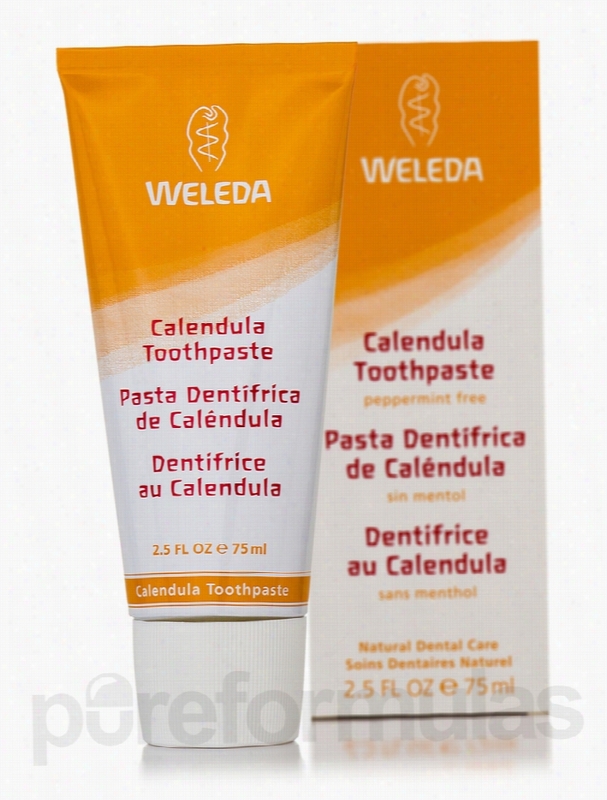 Weleda Oral Health - Calendula Toothpaste (Peppermint Free) - 2.5 fl..
Weleda - In harmony with nature and the human being.Peppermint Free!Natural Dental Care.This peppermint free toothpaste with gantle mineral abrasive particles and pure plant extracts thoroughly cleanses and protects your teeth. Regular brushing helps avoid the build-up of plaque. Organic calendula&sbquo; a soothing herb&sbquo; aids in keeping gums and oral cavity in good condition. Gentle fennel oil is a fresh-tasting alternative to peppermint oil and keeps your mouth feeling clean and refreshed. Ideal when taking Homeopathic Medicines. Free of surfactants and synthetic fluoride. These statements have not been evaluated by the Food and Drug Administration (FDA). These products are not meant to diagnoseÃ¢ÂÂ treat or cure any disease or medical condition. Please consult your doctor before starting any exercise or nutritional supplement program or before using these or any product during pregnancy or if you have a serious medical condition. 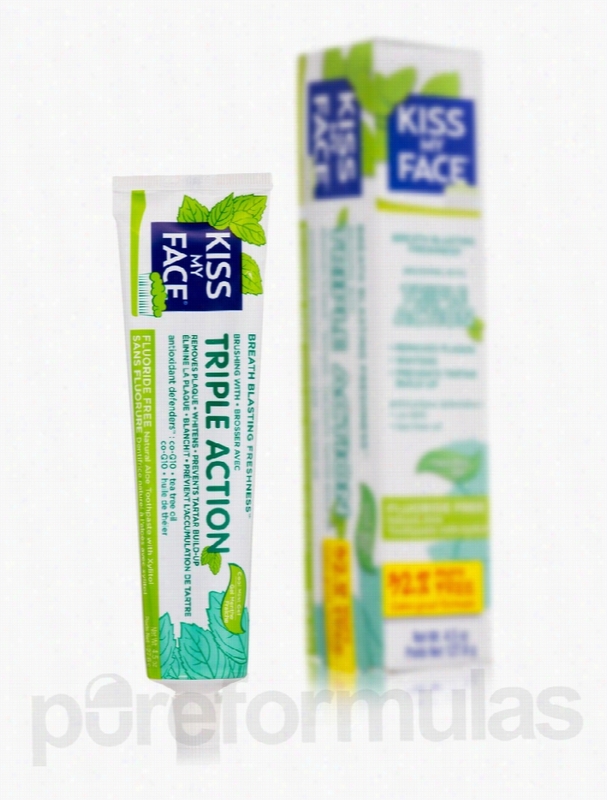 Kiss My Face Oral Health - Organic Aloe Vera Triple Action Oral Care. - Fluoride Free. Natural Aloe Toothpaste with Xylitol.- Breath blasting freshness.- Cool mint gel.- Antioxidants defenders: Co-Q10. Tea Tree Oil.- 32% more free.One Kiss will give you Breath Blasting Freshness&trade; with great Peppermint taste.Triple Action Formula helps:&bull;Remove plaque with Xylitol &amp; Tea Tree.&bull;Whiten with Icelandic Moss.&bull;Prevent tartar build up with Zinc Citrate.Hey Kissers&sbquo; give us a smile! With shockingly great taste&sbquo; this effective formula helps your mouth feel healthy and fresh with Antioxidant Defenders&trade; and nature's most trusted ingredients: Co-Q10 Tea Tree Oil&sbquo;Olive Leaf Extract&sbquo; Xylitol&sbquo; Silica&sbquo; Peppermint.Now with 32% more so you can keep kissing longer... These statements have not been evaluated by the Food and Drug Administration (FDA). These products are not meant to diagnoseÃ¢ÂÂ treat or cure any disease or medical condition. Please consult your doctor before starting any exercise or nutritional supplement program or before using these or any product during pregnancy or if you have a serious medical condition. Kiss My Face Oral Health - Organic Aloe Vera Whitening Oral Care. - Fluoride Free. Natural Aloe Toothpaste with Xylitol.- Breath blasting freshness.- Cool mint gel.- Antioxidants defenders: Iceland moss extract. Tea tree Oil.- 32% more free.One Kiss will give you Breath Blasting Freshness&trade; with great Peppermint taste.Whitening Formula helps:&bull;Whiten with Icelandic Moss&bull;Remove plaque with Xylitol &amp; Tea TreeHey Kissers&sbquo; give us a smile! With shockingly great taste&sbquo; this effective formula helps your mouth feel healthy and fresh with Antioxidant Defenders&trade; and nature's most trusted ingredients: Tea Tree Oil&sbquo; Iceland Moss&sbquo; Olive Leaf Extract&sbquo; Xylitol&sbquo; Silica&sbquo; Peppermint.Now with 32% more so you can keep kissing longer... These statements have not been evaluated by the Food and Drug Administration (FDA). These products are not meant to diagnoseÃ¢ÂÂ treat or cure any disease or medical condition. Please consult your doctor before starting any exercise or Nutritional supplement program or before using these or any product during pregnancy or if you have a serious medical condition. Nature's Gate Oral Health - Cool Mint Gel Toothpaste (Fluoride Free) -. 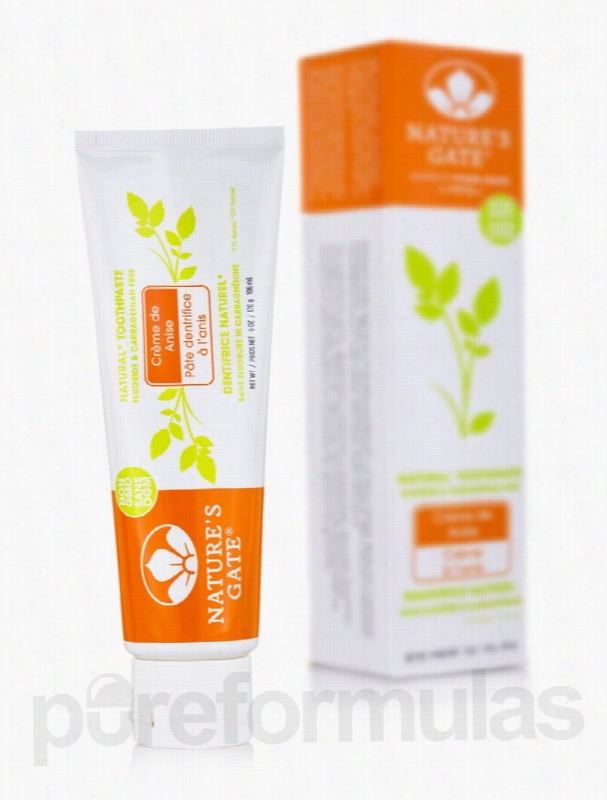 Light up any room with Nature&rsquo;s Gate toothpaste&sbquo; a responsible choice for oral health. Formulated to gently clean and polish teeth while freshening breath. Smile with confidence.Nature Gate signature Antioxidant Blend of Aloe&sbquo; Ginger&sbquo; Bisabolol&sbquo; Cranberry&sbquo; Pomegranate&sbquo; White Tea&sbquo; and Grapeseed work Silica to help refresh and clean teeth and gums. These statements have not been evaluated by the Food and Drug Administration (FDA). These products are not meant to diagnoseÃ¢ÂÂ treat or cure any disease or medical condition. Please consult your doctor before starting any exercise or Nutritional supplement program or before using these or any product during pregnancy or if you have a serious medical condition. 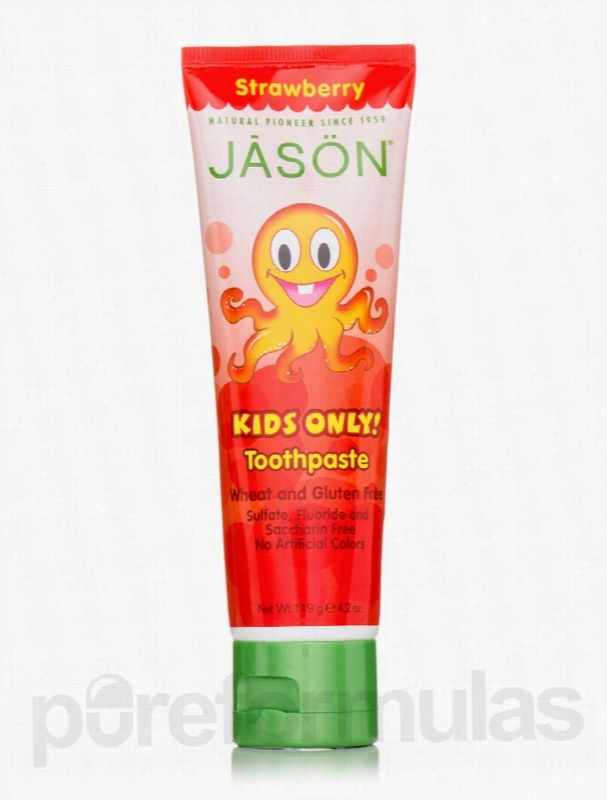 Jason Natural Products Oral Health - Kid's Strawberry Toothpaste - 4.2. Kid&rsquo;s Strawberry Toothpaste 4.2 oz (119 Grams) from Jason&reg; Natural Products helps fortify your child&rsquo;s teeth and leave his or her breath fresh. This organic product combines the benefits of calcium carbonate&sbquo; calendula&sbquo; aloe vera and panthenol. Adequate dental care&sbquo; if followed for primary health may lead to a healthy set of teeth in later life. Research shows that calcium is a mineral that provides strength and structure to the teeth. Most of the body&rsquo;s calcium appears to be stored in the teeth and bones. 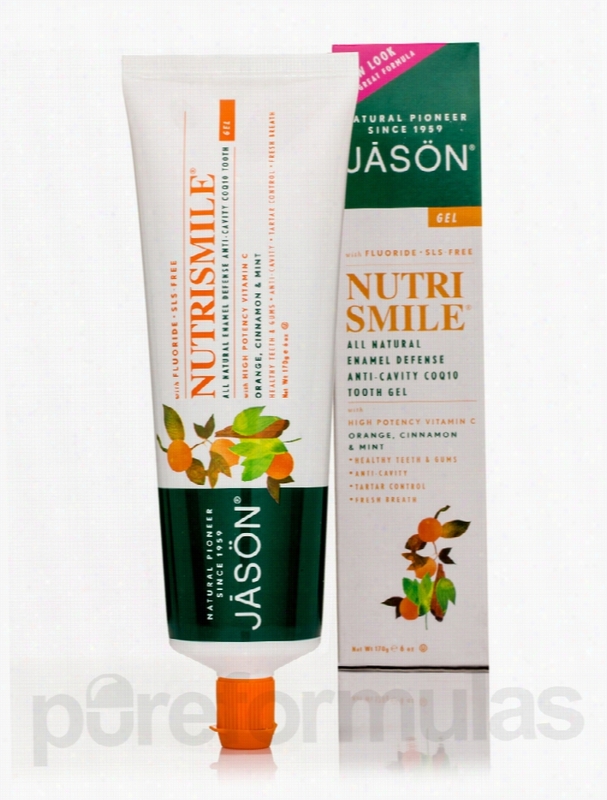 Calcium carbonate present in this toothpaste from Jason&reg; National Products helps maintain healthy teeth in children. Aloe vera is rich in vitamins&sbquo; Minerals and enzymes that could have anti-inflammatory and antimicrobial properties thereby promoting healthy gums and teeth. Calendula flower extracts may be helpful in soothing your child&rsquo;s gums and maintaining healthy teeth. This toothpaste with its fruity strawberry flavor is fluoride and gluten free. Switch to Kid&rsquo;s Strawberry Toothpaste 4.2 oz (119 Grams) from Jason&reg; Natural Products and restore dental health in your children. These statements have not been evaluated by the Food and Drug Administration (FDA). These products are not meant to diagnoseÃ¢ÂÂ treat or cure any disease or medical condition. Please consult your doctor before starting any exercise or nutritional supplement program or before using these or any product during pregnancy or if you have a serious medical condition.